Mississippi, Believe It! 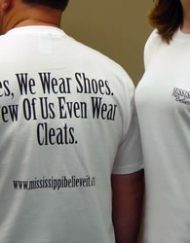 Logo Shirt - Mississippi Believe It! You’ve seen it. That look of astonishment when you say, with pride, that you’re from Mississippi. They just don’t get it. But when you wear this shirt, maybe the light will begin to go off … maybe, just maybe, people will start to see that we’re not a bunch of backwoods hicks … that we are smart, educated, proactive people with an excellent sense of t’shirt fashion! SKU: N/A. Category: Short Sleeve T's.